I recently spent a few days in London, England. It was lovely because I had time with my daughters. On my first evening there, my younger daughter and I looked for somewhere to have dinner that was near my hotel. She found L’Antipasto City. It is a bit tricky to find because the alley where it is does not really look like a regular street. It is near East Cheap and also Monument. It is very central. 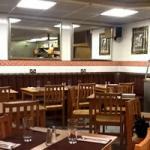 The restaurant has a warm, cosy welcoming feel and the staff are attentive and friendly, but not overly so. However, L’Antipasto City is quite small, so it does get rather busy and you may want to consider booking a table. The menu is Italian, but within that it is wide and varied. We both chose pizza and enjoyed our meals very much. The meals are freshly made in a kitchen open for all the diners to see. The food is delicious. I will certainly use L’Antipasto City again. The cost of our meals in central London was very reasonable. I highly recommend this restaurant to you.